The fact that PSNI were fighting for their Championship One survival didn’t figure at all in the team talk ahead of Saturday’s match, with Larne approaching it the same way as every other game - intent on winning all three points. “Nobody in our situation goes out with the intention of sending the opposition down a division, but that was really no concern of ours. 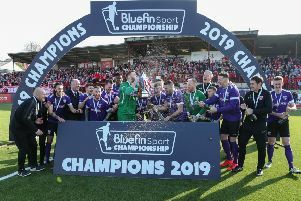 Our job is to go and try to win every game and that’s what we did,” said Larne boss David McAlinden. “They had much more to play for than us and you could sense that there was an immense amount of pressure on them, but our aim had to be to get as many points as we have been doing all season. “Of course, we felt a bit for them when the match ended and they immediately knew their fate because the telephone lines to the Donegal Celtic match were hot. “But Saturday’s disappointment wasn’t the real reason they were relegated because, as I have said many times this season, the best team end the campaign as champions, the runners-up are the second-best and so on - so we can regard ourselves as the fifth-best, while the bottom two teams were the worst over the whole programme of matches. “Indeed, we should have won the game on Saturday - and probably with a bit to spare because we created lots of chances and they were spurned. Despite going behind in the game, we were always the better team. “We finished fifth in the table, which is a big improvement on the ninth spot we occupied last year. “Our aim was always about progression and now we will have to concentrate on building on what we have achieved thus far and that’s what we will be hoping to do,” added the Inver Park manager.